Featuring a mesh top and conveniently stackable design, this durable outdoor end table has a simple refinement that's great for commercial or residential use. 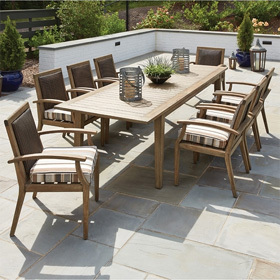 The tea table matches outdoor seating from OW Lee's Lennox Collection. 16"L x 16"W x 17.25"H 12 lbs.